The simplest decision to make is whether to do something — or not. 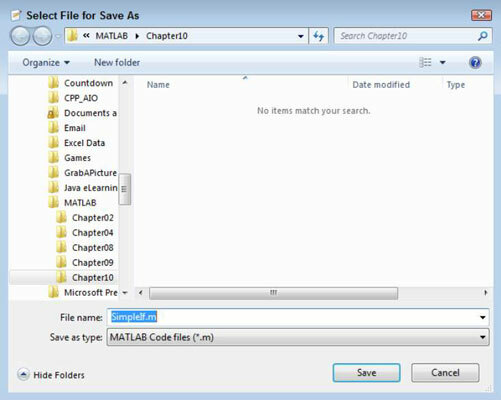 However, you might need to decide between two alternatives in MATLAB. When a situation is true, you perform one task, but when it’s false, you perform another task. There are still other times when you have multiple alternatives and must choose a course of action based on multiple scenarios using multiple related decisions. Starting simply is always best. The if statement makes it possible to either do something when the condition you provide is true or not do something when the condition you provide is false. The following steps show how to create a function that includes an if statement. The example doesn’t provide an output argument, but it does require an input argument. Change the function name from Untitled to SimpleIf. The term input_args is used only to tell you that you need to provide input arguments. In this case, the function receives a value from the caller to use in the decision-making process. This code makes a simple comparison. When the input argument, Value, is greater than 5, the function tells you about it. Otherwise, the function doesn’t provide any output at all. You see the Select File for Save As dialog box. Notice that the File Name field has the correct filename entered for you. This is the advantage of changing the function name before you save the file for the first time. Type SimpleIf(6) and press Enter in the Command window. The input value is greater than 5! Type SimpleIf(4) and press Enter in the Command window. The function doesn’t provide any output. Of course, this is the expected reaction. Many decisions that people make are choices between two options. For example, you might go to the beach today, or choose to stay home and play dominoes based on whether it is sunny. When the weather is sunny, you go to the beach. MATLAB has a similar structure. The application chooses between two options based on a condition. The second option is separated from the first by an else clause — the application performs the first task, or else it performs the second. The following steps demonstrate how the else clause works. In the Editor window, with the SimpleIf.m file selected, click the down arrow under Save and choose Save As from the list that appears. Type IfElse.m in the File Name field and click Save. MATLAB saves the example using a new name. Replace the SimpleIf function name with IfElse. The function can now respond even when the primary condition isn’t met. When Value is greater than 5, you see one message; otherwise, you see the other message. Type IfElse(6) and press Enter in the Command window. Type IfElse(4) and press Enter in the Command window. The input value is less than 6! The example demonstrates that you can provide alternative outputs depending on what is happening within the application. Many situations arise in which you must choose an either/or type of condition. Many life decisions require more than two alternatives. For example, you’re faced with a menu at a restaurant and want to choose just one of the many delicious options. Applications can encounter the same situation. A user may select only one of the many options from a menu, as an example. The following steps show one method of choosing between multiple options. In the Editor window, with the IfElse.m file selected, click the down arrow under Save and choose Save As from the list that appears. Type IfElseIf.m in the File Name field and click Save. Replace the IfElse function name with IfElseIf. At this point, the code provides separate handling for inputs greater than, equal to, and less than 5. Many people make the mistake of not modifying everything that needs to be modified by an application change. Because you now have a way of handling inputs equal to five, you must change the message so that it makes sense to the user. Failure to modify statements often leads to odd output messages that serve only to confuse users. Type IfElseIf(6) and press Enter in the Command window. Type IfElseIf(5) and press Enter in the Command window. The input value is equal to 5! Type IfElseIf(4) and press Enter in the Command Window. The input value is less than 5!